NATC has developed a quantifiable methodology, based on over 50 years of off-road mobility experience, to define the severity and conditions of the terrain that demand greater capability for vehicles. Terrain ranging from severe washboard gravel roads, which can introduce premature structural failures, to severe off-road environments that demand increased vehicle mobility can be quantified for the purpose of evaluating off-road capabilities of a vehicle. Geographical factors can influence the performance and reliability of a vehicle, and are therefore included in rating of the terrain. Using this terrain classification methodology, we can then also quantify an off-road vehicle’s capability to successfully and reliably (reduced maintenance) negotiate specific terrain, which allows vehicles to be matched to the terrain and duty cycle requirements. NATC calls this the Vehicle-Trail Rating Classification System, trade marked as V-TRCS™. V-TRCS™ is a 1–10 rating system that quantifies the terrain severity and the associated vehicle capability for the use of benchmarking and comparing vehicle platforms for marketing and engineering purposes. The V-TRCS™ parameters quantify terrain and vehicle features in a manner that allows for a performance delineation and ranking of vehicles. The V-TRCS™ rating scale can be tailored to suit the requirements of various types of vehicles and the terrain on which the applicable users operate. To match vehicle capabilities to intended severe condition on-road and off-road usage, V-TRCS™ considers the performance of the vehicle as a system (wheel travel, power, torque, ground clearance, etc.) and evaluates the impact of vehicle modifications on overall terrain operation. V-TRCS™ incorporates physical and virtual tests to predict vehicle-terrain interaction. NATC uses V-TRCS™ to evaluate a comprehensive set of vehicle parameters and determine their contribution to vehicle mobility capability. Complete system tuning can be accomplished by ensuring all components work in concert to enhance vehicle mobility. V-TRCS™ can be scaled appropriately to evaluate vehicles ranging from off-road recreational vehicles to the largest logistics vehicle. Selection from a comprehensive, worldwide library of terrains enables V-TRCS™ to include all the applicable conditions for a given study. NATC’s insight to worldwide terrain conditions was gained over 50 years of analysis through extensive vehicle duty cycle, road network, and soil conditions research. NATC’s unique location allows 85% of the terrain conditions where vehicles operate around the world to be simulated within a 150-mile radius of our main proving grounds. The wide range of soil, terrain, trail, and road conditions allows us to accurately evaluate the interaction between vehicles and terrain. Discover how V-TRCS™ can benefit your application by contacting us today! Working with our customers, we account for requirements of vehicle usage profiles and manufacturing capabilities to help optimize designs, development, and manufacturing costs. We identify strengths and weaknesses of the customer developed vehicle solution using applicable references, standards, and historical platforms. And, we help customers create verification and validation test plans to negate risk and ensure a market ready product release. Our engineers are technical experts across a broad range of the transportation industry including passenger and commercial vehicles, off-road recreational vehicles, as well as agricultural, vocational, and military vehicles. Because we have the engineering expertise, the modeling and simulation tools, and the physical test and validation facilities in one location, we offer a complete solution to our customers’ needs. NATC has significant experience in initial development, review, change, temporary change, and revision of maintenance and operating procedures used by military and industry clients. Collaborating with our clients, we define the level of skill set associated with procedures and the level of assumed knowledge for the target audience. With certified master mechanics and experienced former military maintainers on staff, we develop effective, affordable maintenance and operating procedures, and deliver them in a format that can conform to industry or DOD standards. NATC assists regulatory agencies, fleet managers, and vehicle purchasers to develop vehicle requirements and standards by using our extensive knowledge of on- and off-road vehicle operations and lessons learned from historical requirements documents. We assist our customers with determining the system capabilities that are most critical and with resolving conflicting requirements. We have the technical background and vehicle development and testing background to take notional vehicle descriptions and transfer them into concrete, objective, and testable requirements statements. Further, our engineers are active voting members of multiple committees in standards development organizations such as SAE, ISO, TRB, ATA, etc. tasked with maintaining and developing new ground vehicle standards. We strive to meet all of our customers’ testing and diagnostic needs. Whether setting up tests for a root cause failure analysis, or testing a proof of concept, we excel at non-standardized and specialized testing. We have the resources and experience necessary to create and set up any test a customer may need. NATC has a state-of-the-art fabrication facility at our Silver Springs, Nevada location. The shop space allows all aspects of fabrication and production concept integration to occur, from clean sheets of paper builds to frame off, body off, and new design integrations. Whether it is a simple weld fix on an existing test article, or a full design and build of a research prototype, we have the fabrication means to get the job done in a safe, timely, and cost-efficient manner. Our fabrication shop staff produce prototypes and R&D demonstrators ranging from optimized component manufacturing to full system integration of vehicles ranging from commercial utility vehicles to ground combat vehicles to heavy equipment haulers. We have a broad range of on-site equipment available that we regularly apply to concept fabrication, assembly, and testing. In addition to our on-site fabrication facilities, a broad range of approved local sources including Nevada Fabrication Advanced Specialty Technologies (NFAST) are available for CNC machining, forming up to 3-inch RHA plate, precision water jet cutting, etc. to support multi-vehicle builds or unique fabrication requirements. We use these facilities and equipment to formulate designs that then become implemented. We start with pencil to paper ideas, and with the support of computer-aided drawing and modeling, the customer’s end goal comes to fruition. Fabrication, engineering, implementation are all apart of NATC’s comprehensive design expertise. NATC develops driver training courses based on over 60 years of experience as vehicle operators, training instructors, and test engineers. We provide an all-encompassing curriculum to prepare operators for driving the vehicles, understanding the vehicle to terrain interface, and utilizing 100% of the vehicle’s capability. Our training courses range from basic driver and trail experiences up to advanced driver training, and specific training such as ROHVA UTV classes, tire-blowout training, and high speed driver training. We tailor our programs to our customers’ needs, goals, and skill levels. NATC has a vast test facility with access to over 6,200 acres of proving grounds, 735 acres of snow and ice covered terrain in West Yellowstone, MT, and local access to Sand Mountain Recreational Area. With these facilities, we can replicate most any terrain required for a well-rounded and complete driver training program, whether it be high performance/high speed driver training, or training on virgin snow and ice covered roads. Our list of clients is extensive and includes law enforcement agencies, military groups, large corporations, and individuals. NATC develops operator and maintainer new equipment training (NET) courses for the military. These NET courses establish baselines for Program of Instruction training courses to be given to every operator prior to being licensed to operate a military vehicle in accordance with Motor Vehicle Licensing Official’s Manual. NATC instructors coach students while they experience tire blowouts and other hazards in a controlled setting. 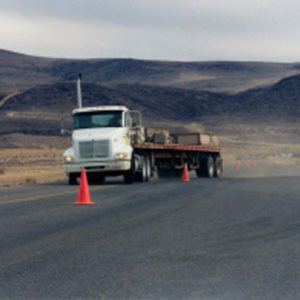 Upon completion of training, a driver will have the knowledge to cope with similar situations that occur in real life. NATC has registered ROHVA instructors on staff to complete the required 1-day course on beginner safety and operational training on UTVs. We have developed and continuously maintain a duty cycle database of terrain, road roughness, and climatic conditions that range from subsets of the North American market to international markets. We evaluate vehicle performance and durability for a wide range of markets with a combination of global experience and formal cooperative agreements with proving grounds in Europe, Asia, Canada, United States, and South Africa. In cooperation with component manufacturers and OEMs, we have developed many duty cycles that are applicable to vehicle platforms ranging from passenger cars to class 8 over-the-road and specialty heavy-duty vocational trucks such as construction, oil field, and mining equipment. Whether you are a small organization manufacturing components or a large OEM making full vehicle systems, our engineers will work with you to develop a duty cycle definition. This generally consists of the following scalable steps, which helps inform the requirements that optimize your products. Identify the product boundary conditions such as cost point, customer base, warranty, time to market schedule. Define how the product will be used, including customer profiles, use cases, road roughness, and climatic conditions for the intended market. Correlate the resulting duty cycle to test operations that account for all real-world inputs in a repeatable, controlled testing environment. If desired, measure component performance during operation (road load data acquisition (RLDA)) and apply it to shaker table inputs. Use the RLDA information for model validation in the computer simulation environment over the duty cycle. This expedites further product analysis and development by eliminating the significant time and cost expense of repetitive test-fix-test cycles.